Guess what, they’ll be playing together next week. We didn’t have to wait long to see the new world order up close for the first time since the opening rounds of the Abu Dhabi HSBC Championship in January, when they played in the same three ball for the first three rounds. Woods won their mini duel by three, 70 69 66 to McIlroy’s 67 72 68, before Rory eventually finished tied second to Tiger’s third. We thought we might have to wait until the Ryder Cup to see them go toe to toe. But the mathematics are such that two biggest names in the game are guaranteed to play together for the first two rounds of next week’s opening FedEx Cup play-off event, The Barclays at Bethpage State Park’s formidable Black Course. 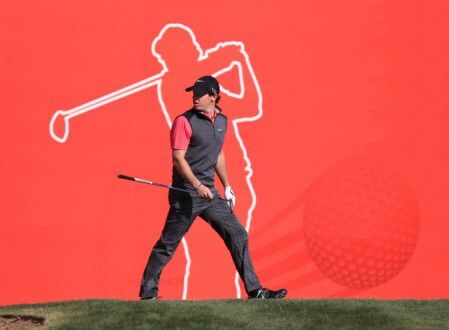 It’s the 13th time this season that they will tee it up in the same event and so far the balance is favourable for McIlroy, who has finished ahead of his boyhood idol seven times, winning the event twice. Woods has had the upper hand on four occastion claiming the Memorial. Their only tie came at Augusta, where they were 40th. So what can we expect of McIlroy and Woods going forward? One thing is certain, he’s not fazed by the prospect. Of course, there are eight months to go before they will be playing for anything truly significant apart from the $10m FedEx Cup bonus money. The Masters is a long way away yet for the first time in his career, McIlroy is thinking about making his mark on the history books by claiming the third leg of a career Grand Slam that has only been completed by five players: Gene Sarazen, Ben Hogan, Gary Player, Jack Nicklaus and Woods. Padraig Harrington is also chasing the career Grand Slam, yet while only Graeme McDowell, Adam Scott and Ian Poulter finished ahead of him on the short list of players who made the cut in all four major this year, he’s disappointed that he didn’t manage a fourth win. “In the end it turned out that nobody had a chance of catching Rory - he was on fire on Sunday and even though Ian Poulter made a run at him early in the round it didn’t matter as Rory was making birdies himself. It was a fantastic win by him and to win two majors by eight shots is amazing. I’m sure, like myself, he wishes there was another major next week. The other disappointing thing about last week is that I didn’t make any inroads in the Ryder Cup standings. I knew that I really needed to win here this week to get myself into the team and so tied 18th is no good and so it looks like I am relying on a pick. Harrington optimistically hopes he can win The Barclays next week and persuade Jose Maria Olazabal that he deserves a pick. It will be an interesting sideshow to what promises to be a nerve-tingling week, for the first two days at least. Rory McIlroy is happy being plain old Rory McIlroy. Picture Eoin Clarke/www.golffile.ieRory McIlroy confessed that trying to act like Tiger Woods cost him the Masters. But realising that mistake helped him become a major winner and the hottest players in the game. Rory McIlroy warms up for the final round with some bunker play. Photo Eoin Clarke/www.golffile.ieRory McIlroy has revealed how a Sunday morning nap could have cost him his chance of US PGA glory.